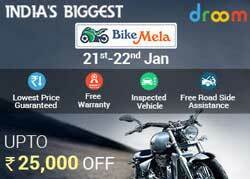 India’s Biggest Bike Mela from Droom where you can get upto Rs. 25000 off on all bikes on the offer page. In this offer, so many bikes are included for sell at upto Rs. 25000 discount. Bike Mela is valid from 21st to 22nd January 2016. Using this offer you will get Lowest price guaranteed, free warranty, inspected vehicle and free road side assistance. To get this offer please follow the below given steps.